Not much going on basketball-wise and I’m in kind of a “I can watch or it not, I’m waiting until september” on any given night mode with the Rangers, so let’s talk about food, shall we?Long day at work, we had some errands to run and we were hungry. So we decided to spend friday night visiting Pier One, Target and grabbing dinner in the south Cooper area. And did I mention I’ve become a huge fan of Red Lobster lately? Mom and Dad used to take me there as a kid once or twice a year and I’d get popcorn shrimp. Mostly on special occasions. And then I moved around the metroplex for number of years and there just never seemed to one of their locations nearby. So I guess I went literally twenty years without eating there. However, me and my wife went there a few months ago for the first time in a couple of years to see how the current Red Lobster food was and all I can say is there food is really good…as good as I remember as a kid. The prices are very reasonable for good fish and the service is consistently friendly, prompt and welcoming. The nice thing is even though they seem to be pretty busy when we’ve gone, it’s a huge restaurant and rarely is there a long wait (maybe 15-30 minutes on friday night? Not bad by south Arlington/Highlands/I-20 standards during peak eating times). Worth the wait! Chesapeake Shrimp with Crab A Chesapeake-grilled shrimp skewer topped with crab butter and five seafood-stuffed shrimp with lobster beurre blanc. Served with rice and choice of accompaniment. The salad the comes with the meal has chopped tomato and cucumber with the lettuce, and the vinaigrette dressing they have is one of the best I’ve ever had. Nice crunch texture for the salad, a nice change from most restaurant which serve sliced tomatoes and cucumbers. A great pre-dinner salad. I’m one of those rare folks that just doesn’t like cheese in any form or fashion, but my wife does. She loves the biscuits (that have a cheese flavor I think) that are served before the meal as well. I’ll take her word for it. As for the main course…the skewer shrimp (8-10 I’m guessing?) are just the right texture, kind of reminding me of a gently scampi-type flavor…not too strong or overly seasoned like I’ve had at some other restaurants..but nice and satisfying. The seafood stuffed shrimp are shrimp with a crabcake type filling on each of them and a rich sauce matches nicely with it. I usually have green breans as the side dish, which taste great and adds some nice color to an already appealing presentation. As a whole, the plate gives you a nice exploration of vivid but expertly assembled and matched flavors–sweet, garlic, bitter, sour, salt, rich, light, soft, crunch, succulent, satisfying. Good stuff. It’s a lot of food, too. It was as good as a lot of the dishes I’ve tried at seafood places that can be more expensive like Rockfish, Pappadeaux, etc. I’m not a food writer, but sometimes it’s fun to re-discover a restaurant you haven’t been to in a while. As long as the service is as friendly and the food is consistently good, it’s a good value in my opinion and we’ll be back. Between Razoo’s and Red Lobster, I’ve got two of my favorite seafood/shrimp places nearby. 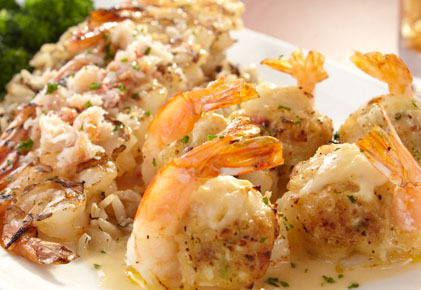 Feel free to comment–do you eat at Red Lobster often?